BrightLogic's catalog of content options offers a large variety to choose from for your ActiveFloor System. Our content creators specialize in ActiveFloor Game, Visualization and Experiential design and offer only the best possible user-tested content. Our Team is also available to create custom content for your ActiveFloor System. Every month we shine our LED lights on an ActiveFloor app we think you'll love! No matter the age, big or small, everyone will feel like a kid again as these ethereal bubbles float around you! We bet you can't resist the urge to pop them; use your hands, your feet, any way you choose! Get lost in space as your movements create interstellar clouds called nebulas! Float among the jellyfish in this visualizer. Various types of jellies follow you around the floor as you get lost in their mysterious ways. Walk amongst the fireflies as you explore a deep dark forest. In true fall form, kick the leaves out from under you as you make your way through all the pretty autumnal colors. This visualizer is reminiscent of the budding beauty experienced in Spring. Walk onto the floor and watch as beautiful flowers, vines, and leafy greens emit from your step. It’s a sight to behold! Feel fancy while you glitter and shine across the ActiveFloor. This visualizer is the perfect effect to dazzle the crowd with! Who doesn’t love a good bubble pop? This effervescent game starts with bubbles abounding so you get to hop around and pop them! Sprint around as bursts of rainbow color flow from your movements. This visualizer will have you feeling giddy as you swirl around over the rainbow! Particles is a Visualizer that attracts and pushes away the content under your feet. Its style can change dramatically, whether you're looking for interesting colors, shapes, and reactions. Walk on water and interact with some sea creatures in Fish! This experience provides a serene feeling as ripples pulse away from you. Fish also swirl around as you walk by them on the floor. Ripple follows your movements while creating rings of light that sparkle, shimmer and make it look like you're walking on water. 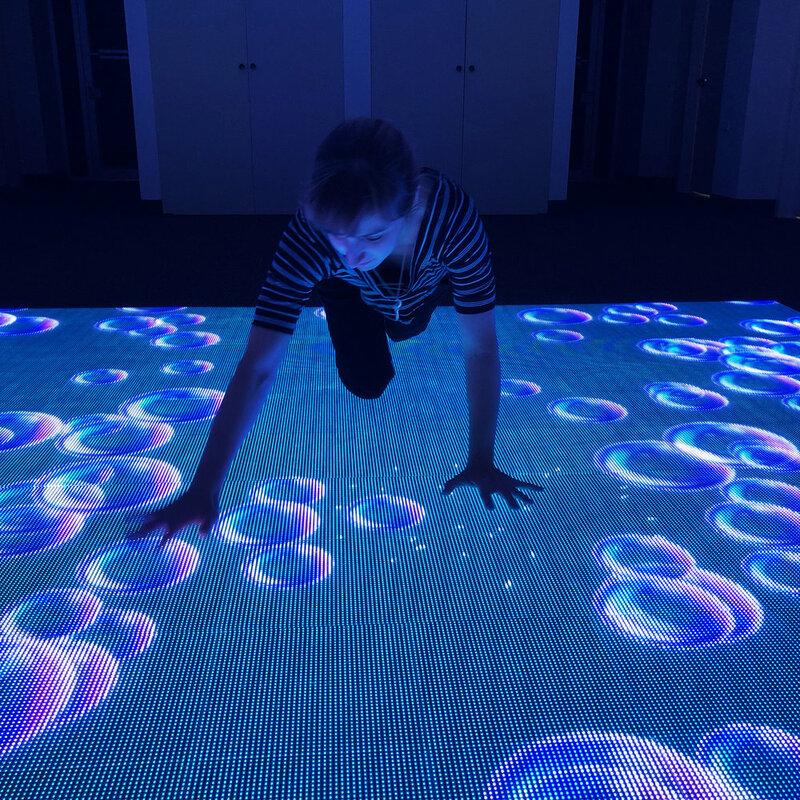 Plasma shows off smooth pulses and waves of color that morph together as you walk around on the ActiveFloor's surface. Floor Burst puts a fireworks show under your feet! As you activate sensors, the floor explodes with firework-like bursts of color! Immerse yourself in the world of comic books and feel nostalgic as you walk around the classic stylized panels while effects appear beneath you! Hypnotize yourself as clocks and spirals appear beneath you while you move around the ActiveFloor. Can you identify the constellation? In this multiplayer game, players look to identify the stars in the sky. When all the right stars are found, the constellation comes glimmering to the forefront! Create interesting and colorful pixel art with Paint by Pixels. Harness your inner DJ through mixing up music samples by stepping on the colored pads. Bass Beat is also easily customizable, enabling you to change the audio samples with custom tracks. Key Striker is our very own gigantic piano. Use one large piano for solos or use two pianos back to back; it makes duets easy and fun! Active Math shows the distance and angles between different sensors triggered on your ActiveFloor System. Activate as many as you can to see more data! ARE THESE CONTENT OPTIONS INSPIRING YOU? SHARE YOUR INSPIRING IDEA HERE! Jump on any dots that have 3 or more of the same color next to each other to eliminate the color block. Claim the most area on the floor to win this fast paced and fun game! Bring some arithmetic to your ActiveFloor System with Sum It Up. This game offers basic Addition, Subtraction, Division and Multiplication equations to test your mental strengths and have fun! This memory game's objective is to visually repeat as many shapes as possible in a row. The game gets faster and longer as you get further into the challenge of Sequence! How far will you get? Play the ActiveFloor System's version of Soccer in this multiplayer game. Get the ball in the goal to show off your skills! Journey to the stars in this grand galactic adventure! Discover and collect as many space prizes as you can find. Explore alone or race against friends to see who can reach far beyond the stars. Turn on all the neon tiles on the floor to activate the Goal! Watch out for the glass connector tubes; if you break one neon gas will be released and the game will be over. Stomp as many bugs as possible to stop them from overrunning the ActiveFloor. Go it alone or with friends and see who can squash the most bugs! Explore deep within the dark caverns to discover shiny rare gems! Race against the clock to break open as many rocks you can find and reveal the secrets within! Venture into the caverns alone or with your fellow miners to see who can mine the most gems! Will you be the one to find the elusive diamond in the rough? With the game Ricochet everyone on the floor becomes a "bumper" to bounce a pinball off of. Get the pinball into the target hole to complete the round! In this game each player uses the deflector that appears under their feet to shift the laser by 90 degrees to a receiving point. Each level is randomized, making every game a new challenge! Squash as many green gremlins as you can! Play on your own or against other players. Scores are displayed providing a competitive and entertaining environment for kids to keep score. Tilt the board around to roll the ball towards the target hole. If you're really brave try to collect as many gold coins as possible! Move your feet to the beat in the challenging and high-cardio game of Groovy Shoes! Land on the pads of color that are coming your way to score points as you dance to the music. Get ready to battle in the game of Ping. Keep the ball out of your goal and score on your opponent to win! Each player controls the angle of their deflector with their feet, watch out as the bonuses can catch you off guard! Hit the targets as quickly and precisely as possible to beat the high-score. Focus on your skills solo or compete against your frenemy! GET THE LATEST CONTENT OPTION UPDATES DELIVERED RIGHT TO YOUR INBOX! Sign up with your email address to receive news and updates on Content Options, Showcases and other awesome stuff from BrightLogic. Ready for your ActiveFloor System? Yes, I want a Quote now!